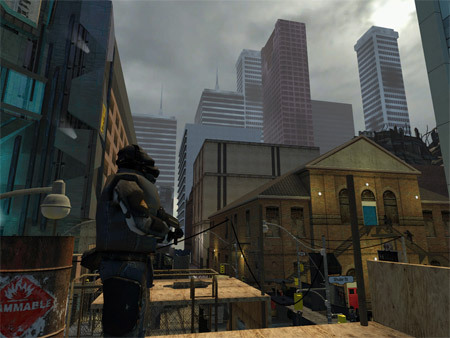 City 7: Toronto Conflict is an interesting looking mod, produced as part of the first thesis project from the Game Design program at George Brown College in Toronto, for Half-life 2. City 7: Toronto Conflict, is an action packed Half-Life 2 mod with a variety of unique levels and game play. Explore what has become of City 7 in areas like Dundas square, Eaton Center , Mel Lastman square, St. Michael’s Hospital and TTC system under the Combine rule. This version features Gordon Freeman as the main character, stuck in Toronto due to a teleporting accident in Kleiner’s lab. Try to escape this war torn city by finding any type of teleporting technology and send him back to City 17. Despite our small development team and short production time, we managed to get halfway to the CN tower and have already created 2-3 hours of fun and action packed game play! We want to finish this mod the way it was intended it to be, as a glimpse at what happen to a part of North American during the Combine invasion. Seeing as we’re on the topic of Half-life 2: Episode 2, here’s a bunch of cool stats that Valve released on the game (that I meant to write about before, but forgot). There’s some cool new stuff in there like a heat map of where players have died the most.